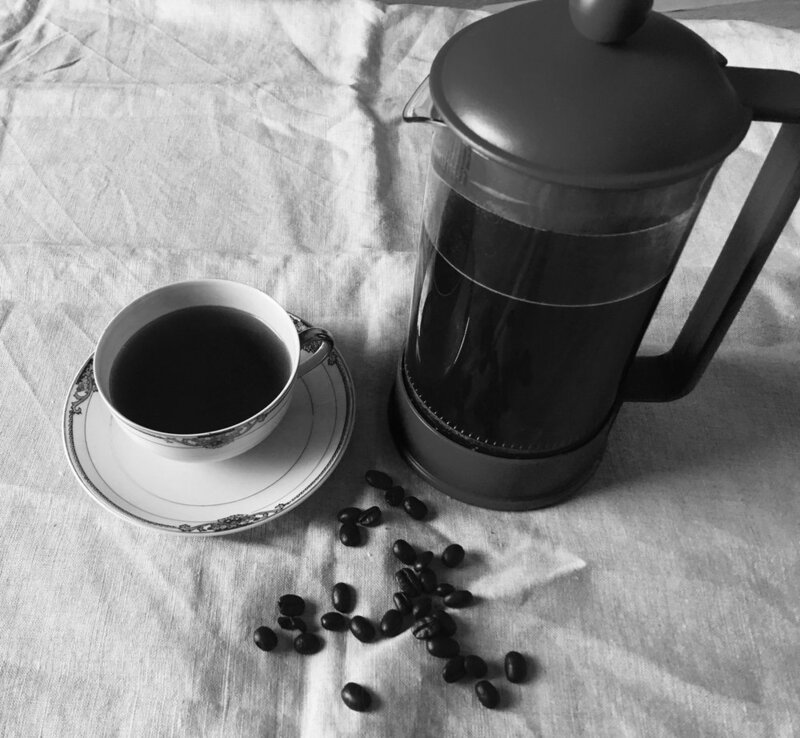 French Press coffee should really be called Italian Press coffee, since it was designed in Milan in 1929 (in Italian, it is called a caffettiera a stantuffo). Brewing coffee this way really brings out all the flavors of freshly-ground coffee beans...plus a French Press on your kitchen counter just looks super-elegant (the modernist one shown here is the Bodum Brazil). Grinding the beans by hand is kind of fun, we have a ceramic burr grinder that grinds enough for two cups at a time. Our absolutely favorite coffee bean is a secret...but I will tell you it comes from Trader Joe's. Bring water to a boil in a tea kettle. While you're waiting, grind coffee beans in a hand-cranked burr grinder. Pour grounds into an 8-cup French Press, and add enough boiling water to fill the French Press up nearly to the top (leave about 1 inch for the plunger). Now you want to stir the grounds into the water, but don't use a metal spoon or you risk cracking the glass beaker...try either a wood spoon, or you can gentle swirl the whole French Press around a bit to combine the coffee and water. Place the lid on (plunger all the way up) and let steep for 4 minutes. Now comes the fun part...gently push the plunger down to get the final results. The coffee will be rich and hot, and is great with cream or sugar! A word of warning--don't completely drain the French Press when you're pouring the coffee...you can get a lot of silty residue as well as grounds in your coffee mug, which of course aren't nice to drink! Some garbage disposals can handle coffee grounds while others get hopelessly jammed from the grounds...if you want to play it safe, you can toss the grounds in the trash or better yet, compost them in the garden!